汪锋, 陈艾荣, 张剑. 基于壳梁组合单元预应力混凝土梁非线性响应[J]. 同济大学学报(自然科学版), 2018, 46(7): 861-867. DOI: 10.11908/j.issn.0253-374x.2018.07.001. 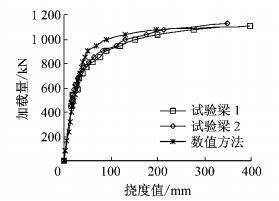 Abstract: With the nonlinear shell-beam composite(SBC) element, the nonlinear analysis model of prestressed concrete T beam was established and the whole failure process was studied. 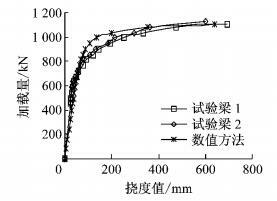 The stiffness reduction and stress redistribution of T beam were analyzed. 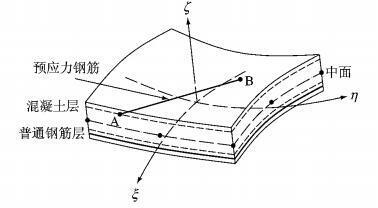 Based on the layered shell element and the beam element calculation model, the prestressed reinforcement was simulated by the SBC element, and the ordinary steel and concrete were simulated by the layered shell element. 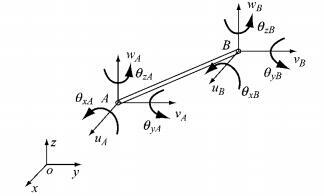 The material nonlinearity of prestressed concrete T beams was considered reasonably through Owen criterion and others. The spatial prestressing effect of the prestressed steel bar was simulated effectively and the corresponding nonlinear calculation program was developed. 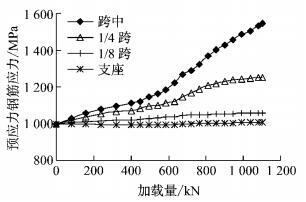 The calculation results of this method are in good agreement with the experimental results of the test beam, which shows that the nonlinear SBC element method is proper for the analysis of the structure. It provides an effective method for evaluating and studying this kind of thin-walled structures. 式中：u、v、w为整体坐标系下x、y、z方向的位移; n为壳元节点数; Ni为节点i的形函数; hi为节点i处壳元厚度; νx, 1i为节点i的节点坐标系ν1与x轴夹角余弦值(其余类推). 为研究预应力混凝土T梁的非线性受力性能，交通部第二勘查设计院进行了二根装配式后张法全预应力混凝土简支T梁的试验.预应力混凝土T梁尺寸如图 4所示(图中, p为荷载).采用40号混凝土，预应力钢筋采用24Φ5的冷拉碳素钢丝，极限抗拉强度1 600 MPa，控制张拉应力1 200 MPa.混凝土抗压强度36 MPa，抗拉强度3.35 MPa.混凝土弹性模量36 GPa，预应力钢筋弹性模量220 GPa.6根预应力钢筋沿T梁纵向位置坐标以及普通钢筋等构造详见文献. 为进行预应力混凝土试验T梁非线性受力性能分析，建立非线性力学分析模型，共分176个单元，759个节点，其中壳梁组合单元48个，分层壳单元128个.对普通钢筋和混凝土均采用分层壳单元模拟，对预应力钢筋用壳梁组合单元模拟.由试验方法测得二根试验梁的极限承载力为1 104 kN和1 125.8 kN.利用本文的壳梁组合单元方法，计算得预应力混凝土T梁的极限承载力为1 100 kN.梁体1/4跨和跨中梁底的荷载-挠度曲线分别如图 5和图 6所示，典型加载步下梁的裂缝发展模式如图 7所示. 预应力混凝土T梁典型截面的梁底预应力钢筋的应力-荷载曲线如图 8所示.由图 8计算结果可知，接近破坏时，跨中截面的预应力筋已达1 547.02 MPa.跨中预应力筋的应力增长速度最快，1/4跨预应力筋的应力增长速度次之，1/8跨预应力筋的应力增长缓慢，而支座处预应力筋的应力-荷载曲线基本保持水平. 式中：η为应力重分布系数；Δpt为t-1至t时段的荷载增量; Δσt为与荷载增量Δpt为t-1至t时段的应力增量; Δp0为弹性阶段的荷载增量; Δσ0为弹性阶段的应力增量.由图 8可得跨中预应力筋的应力重分布规律(应力增长率和应力重分布系数)见表 2. 表 2中，90.20=945.8-855.6；55.07=1 456.54-1 401.47；0.61=55.07/90.2；1.97=0.61/0.31.由表 2可知，随着荷载增大，预应力筋的应力增长率和重分布系数都发生一定变化，其比弹性阶段相比都有增大.在加载过程中混凝土出现裂缝及压碎后，所施加的荷载逐渐转为由预应力钢筋来承担，故与弹性阶段相比，其应力增长速度较大. 张宇锋. 沪宁高速公路扩建工程桥梁极限状态实桥试验研究试验[R]. 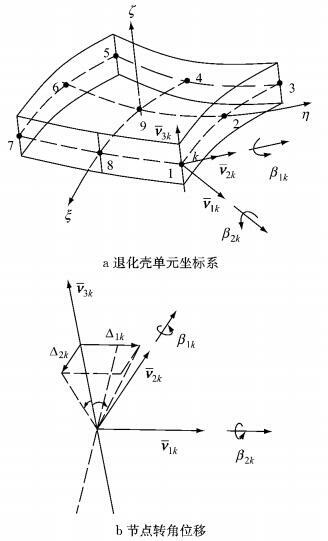 南京: 江苏省交通科学研究院, 2006. ZHANG Yufeng. Test and study on the ultimate state of the bridge in the expansion project of Hu-Ning Expressway[R]. Nanjing: Jiangsu Academy of traffic Sciences, 2006. 杨耀铨. 跨径25米的装配式后张法预应力混凝土简支梁静载试验报告[R]. 北京: 交通部第二公路勘察设计院, 1979. YANG Yaoquan. Report on static load test of prestressed concrete simple supported beam with 25 meters span[R]. Beijing: Second Highway Survey and Design Institute of Ministry of communications, 1979. 汪光庐. 整体多片式T梁结构空间分析[D]. 上海: 同济大学, 2002.